In the past decade, web-based applications have really come into their own. This is great for authors, because it makes collaborating much easier, especially when your co-author doesn’t live nearby. The tools in this list run the gamut from online chat software to fully fledged cloud-based authoring software. And, of course, many of them can be wonderful productivity boosters for solo authors, too. Slack is a web-based chat client. 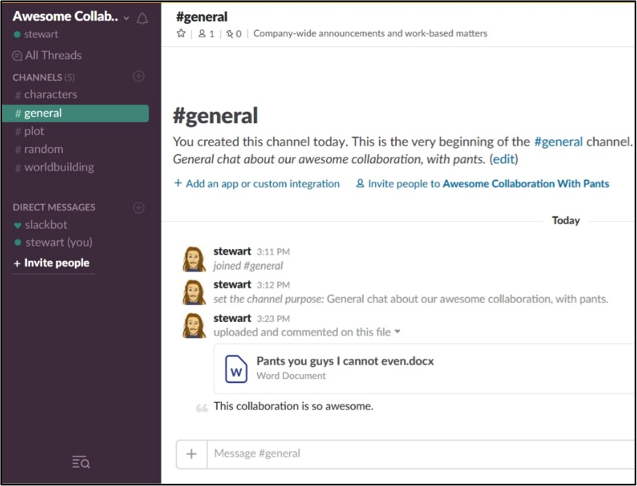 Unlike some other chat clients, Slack allows you to create channels for each aspect of a collaboration, and it also keeps a searchable log of up to 10,000 messages and allows you to store up to 5GB of files on your team’s page. You can pay a monthly fee to get more messages saved and more file space. Trello is an online project management application which lets you create stacks of virtual note cards. You can assign labels to cards, as well as due dates, checklists, attachments, and more. If you’re collaborating on a Trello board, you can also add comments to each card—useful for remembering what you’ve discussed about each aspect of your work in progress. Gingko App (sic) is a web-based outlining and note taking tool. With it, you can create “trees”—hierarchically-arranged stacks of notecards. Gingko contextually highlights notecards depending on which branch of the tree you’re on, so it’s easy to see which act contains the chapter you’re reviewing. Notecards can be formatted with Markdown. Gingko trees can be shared for simultaneous editing. Evernote is a web-based note-taking tool, great for jotting down quick notes about things as well as for more involved planning. You can also use Evernote to upload files and—if you’re on Chrome—the related “web clipper” app allows you to take screenshots of websites, which can be useful for quickly saving important bits of research. 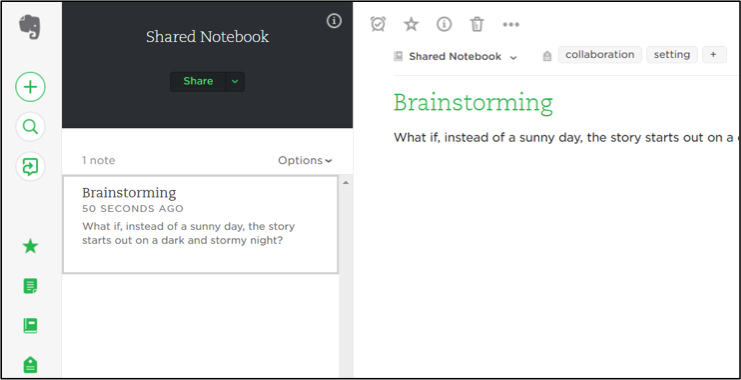 Evernote notebooks can be shared for simultaneous editing, and you can also chat with collaborators. Google Docs is Google’s web-based word processor. It has many of the features of other word processors, but also allows simultaneous editing and chat, and unobtrusively tracks changes, making it easy to retrieve earlier versions of your work. You can export from Google Docs to common formats like DOC and PDF, and pair the app with Google Drive to get storage as well. OneDrive is Microsoft’s cloud-based storage application. 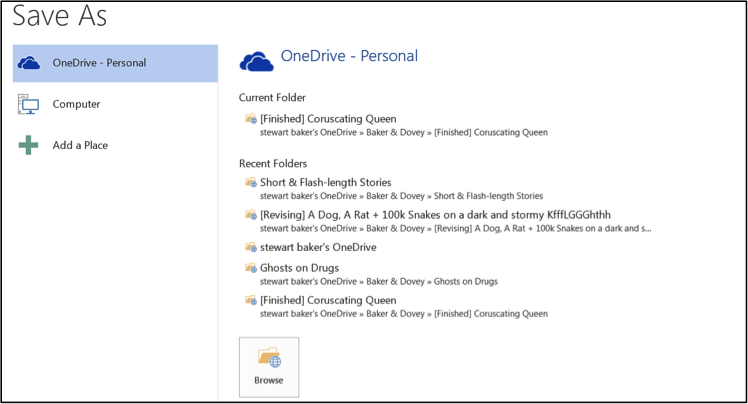 OneDrive folders can be shared with others to allow simultaneous editing on the same file. OneDrive’s web interface integrates a lot of other Microsoft products, like Skype and Office 365, and you can edit OneDrive files in the desktop edition of Microsoft Word—a nice touch if you both use Word and don’t want to switch to something new for collaboration. Unlike the other web applications on this list, WordSlingr was created specifically for writing novels. Billing itself as an “online writers studio,” WordSlingr lets you brainstorm, outline, store research, set and track word count goals and—of course—write. Also unlike most of the other items on the list, you’ll need to pony up for one of WordSlingr’s paid plans to take advantage of its collaboration tools. 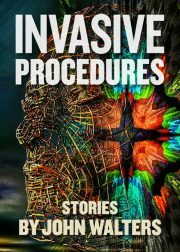 Stewart C Baker is an academic librarian, speculative fiction writer, and occasional haikuist. 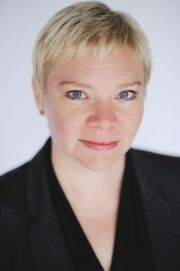 His fiction has appeared in Writers of the Future, Nature, Galaxy’s Edge, and Flash Fiction Online, among other places. 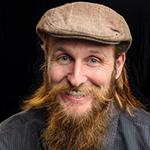 Stewart was born in England, has lived in South Carolina, Japan, and California (in that order), and currently resides in Oregon with his family­­—although if anyone asks, he’ll usually say he’s from the Internet. Great Article. Zillable (www.zillable.com) should be near the top of the list as the world’s first collaboration and innovation platform. Rather than release an MVP product (typical of most startups), the Zilalble team invested 5 years and over 100,000 man-hours of development. Zillable is now live, featuring chat, notes, tasks, boards, and much more. 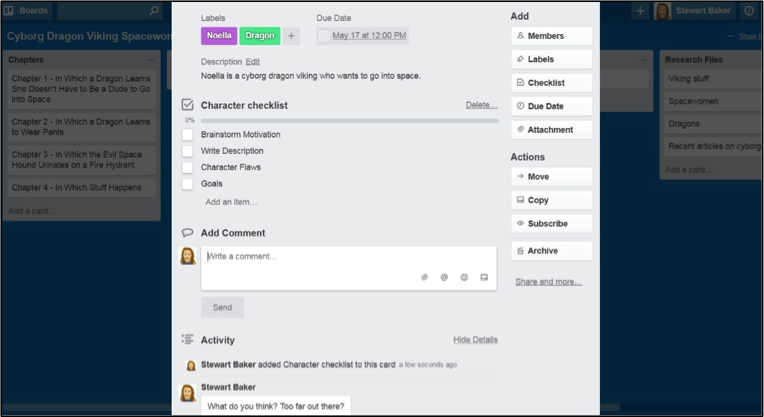 Think Slack meets Asana meets Trello. Trial it for Free and let us know what you think. If you need access to more than the basic plan, let us know and we will upgrade you to the plan of our choice so you can evaluate us appropriately. Thanks! Thanks for sharing list of online collaboration tools. One of online team collaboration tool which i would l like to recommend you is TaskQue. It is very popular among project managers world wide. It is good for productivity management. Great list. I’d like to add one more category to your list is project management. For project management, you can try ProofHub. From effortless task management to integration options, ProofHub offers it all – features for project management time tracking, chats, discussion boards, and team calendars for staying aligned, Gantt charts that make project progress graphic at all times, fast reporting system, notes for attaching, storing and sharing valuable content, project logs for managers to stay on top of every detail, in-app notifications for deadlines that shouldn’t be missed, and more.